Trim the ends of the cucumbers. With a vegetable peeler, peel them in 1/2-inch intervals, leaving 1/2-inch strips of peel intact. Halve the cucumbers lengthwise, scoop out and discard the core, and then cut them into 3/4-inch dice. 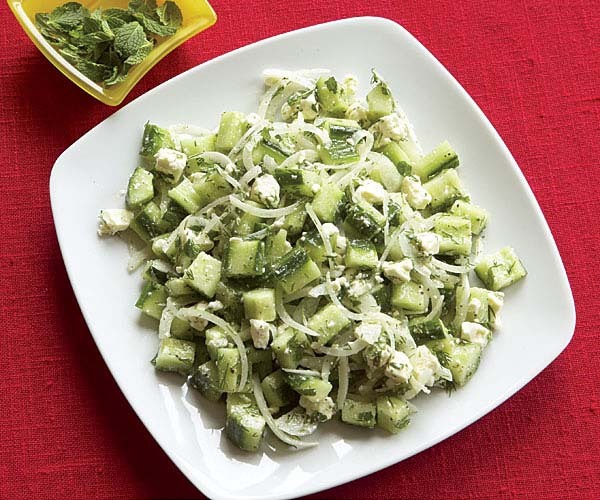 In a large bowl, combine the cucumbers, feta, onion, mint, and dill. In a small bowl, whisk the olive oil and lemon juice and season to taste with salt and pepper. Gently toss the dressing with the cucumber mixture. Season to taste with salt and pepper, garnish with the mint leaves (if using), and serve. This Greek-inspired salad is nice with broiled or grilled lamb chops rubbed with cumin, cinnamon, coriander, and a little olive oil and lime juice. This a very refreshing salad. We made it for a wedding potluck and it got rave reviews. A perfect summer potluck or picnic dish! great summer side. I did not make any changes in this recipe. Does anybody have this recipee and can share it? I have a beautiful picture of the salad and some great reviews, but the recipee is not on the page! 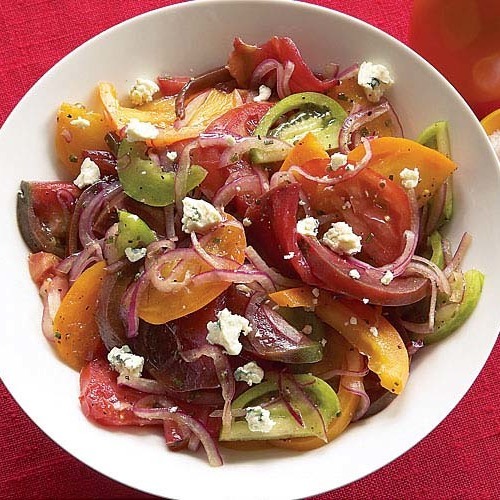 Quick, easy to throw together and light--I agree with the reviewer who called this a good summer salad. I always love the combination of mint and cucumber--it tastes like spring and summer. I reduced the amount of dill by 1/2 because I was afraid it would overpower the salad, but other than that, followed the instructions.